State Sen. Mark Obenshain (R-Rockingham) released the following statement today in response to the Governor’s recent announcement for EVgo to set up electric vehicle charging stations. About two years ago through a settlement agreement with the U.S. Department of Justice and the Volkswagen Corporation, the automobile manufacturer agreed to “invest” $2.9 billion in an independently administered environmental trust, which will fund projects to fully mitigate the diesel emissions caused by their offending vehicles. Virginia’s portion of this settlement turns out to be about $93.6M to be paid to the Commonwealth over the next ten years. That’s a substantial amount any way you look at it. Virginia is going to use that $93.6M in a variety of ways, but it was allowed use up to 15 percent for electric vehicle charging stations. The optimal word here is ‘allowed’. The settlement doesn’t REQUIRE that Virginia spend a single dime of these funds on electric charging stations. But do you think our liberal Governor and Attorney General decided to do so? You’re not mis-reading this…$14M. On car charging stations. This is social(ist) engineering at its worst. I, for one, don’t appreciate the Northam Administration’s attempt to engineer social change and influence what I should or should not drive. Get your hands out of my life. The government doesn’t run gas stations; and it shouldn’t be setting up car charging stations either. If that’s not enough, here’s what I know about EVgo. It’s based in Los Angeles. Its CEO is Cathy Zoi who has collectively given almost $17,000 (that we know of) over the last ten years to liberals like Barack Obama and Hillary Clinton. She is a George Soros associate and is the founding CEO of the Alliance for Climate Protection, which was established and chaired by Al Gore. We could’ve done so much better with that $14M. Rather than use it towards I-81 improvements, or increasing funding for soil & water conservation districts, or for incentivizing agricultural best management practices (all of which have an environmental impact on our Commonwealth), the Governor decided that Virginians would be better served by a crony capitalist deal with a California company, led by a Soros associate, installing electric car charging stations. Heck, even liberal states are using it to replace old school buses for their children. I could’ve gotten on board with that. Last year, the Attorney General took money out of another major settlement and used it to pay hefty raises to his senior staff – many of whom were his political appointees — when other state employees were not getting raises. This year, it appears as if he and the Governor are using another slush fund to pay off political debts to the likes of George Soros, Tom Steyer and their other left wing environmental extremist pals. This spending is not reflective of our needs or values, here in the Valley or statewide. These are priorities of left-wing environmental extremists and they are being funded out of a slush fund allowing the Governor to bypass the budgeting and appropriation process. We’re just a few months away from the next election cycle. This is just one more example of why we need conservative leadership in Richmond and in Washington, DC. I don’t like to see that much money going to a liberal company in liberal California claiming to be fighting “climate change.” I want those funds being used here in Virginia to improve the quality of life for all of our citizens. 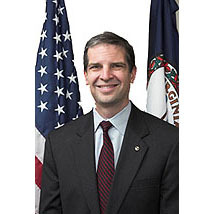 Senator Obenshain represents the 26th District in the Virginia Senate. The district includes the city of Harrisonburg and the counties of Warren, Shenandoah, Page, Rappahannock and Rockingham (part). He is Chairman of the Senate Courts of Justice Committee and Vice-Chair of the Virginia Crime Commission.